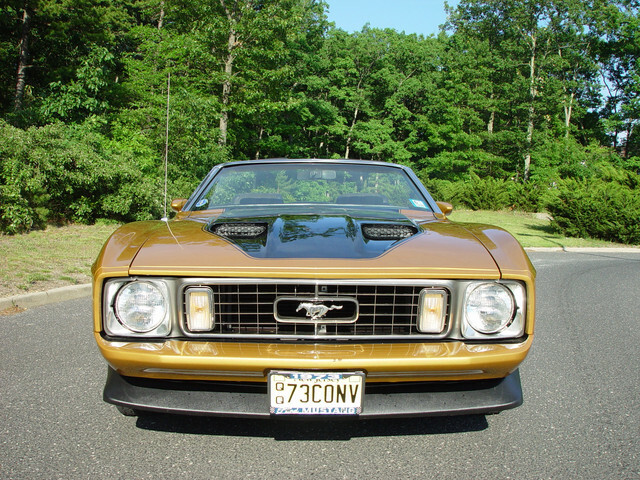 I am looking at a 1972 or 1973 Mach 1. The grill running lites are horizontal not vertical. The owner said it’s a 1973. 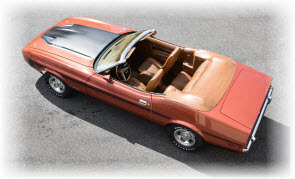 Did any 1973 Mach 1’s come with horizontal lights? If everything goes right I will go see up close Tuesday. They are send full vin # Monday. By "running lights" I assume you mean the parking/directional lights in the grill. There were no other lights used up front on 73 from the factory. No. All 73 models used the same vertical parking lights in one of two different grills.... the Mach 1/Decor Group grill or the standard grill. Any links to the sale or pics? Before you go look at it, make sure you know what the VIN (vehicle identification number) means. 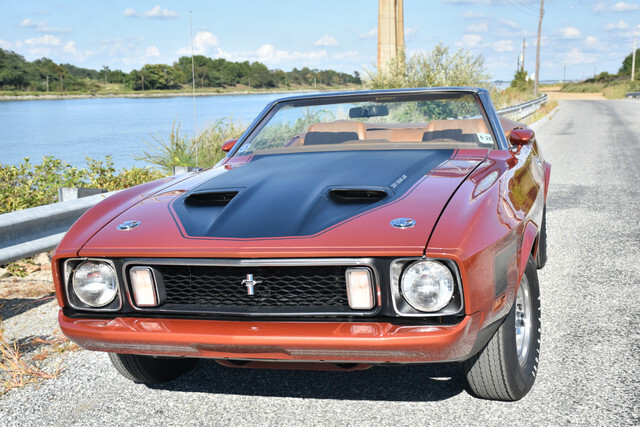 It will tell you the year and body style, as well as engine it came with and if it's a Mach 1. There have been several VIN "decoders" posted on our forum as well as the internet. It's not uncommon for people to swap grills from '71s and '72s into '73s and vice versa. The rectangular headlight bezels are also specific to '73s, '71 and '72 are round. If the VIN # is a 73 and has 72 or 71 front end parts may have been in a bad crash so look very close. Also if they changed the front fenders in the repair they are different on the 73 due to the huge 5 mph crash bumper. Front valance is also different. Be very aware of what will have to be replaced if you go original. If the door sticker is not still there I would almost want to pull a front fender to look at VIN# on the inner fender shock tower. The Ford VIN# tag is in the dash on drivers side but you can swap dash upper out from 71 - 72 to a 73. The 73 dash is also different in that there are two Phillips screws near the front edge of the pad that are not in a 71 72. Could be a VIN# switch. Here in NC they verify that when you register the car. The rivets that hold the VIN# in the dash are special and should look like a flower not just a round pop rivet. They are very expensive to obtain. Part of keeping you from switching VIN#'s. Thanks for all the info. I have a 1972 Mach 1 that I bought new. I'm working on restore. I didn't know that the 1973 didn't have lower turning signal lights like my 72. Thanks for all the info. With the things I could see from distance, I'm going in very carefully. I don't know that I would even believe the door tag VIN if I suspected a front end replacement. The door could have been replaced at the same time. It comes down to looking at clues. The rear quarter panels are different for '73, '71 didn't have the seat belt light on the passenger side dash, date codes on the sheet metal, etc. I saw one example where the inner fender VIN had been spiced in, but with a crappy welding job. (08-19-2018, 10:36 AM)Carolina_Mountain_Mustangs Wrote: If the VIN # is a 73 and has 72 or 71 front end parts may have been in a bad crash so look very close. Also if they changed the front fenders in the repair they are different on the 73 due to the huge 5 mph crash bumper. Front valance is also different. Be very aware of what will have to be replaced if you go original. If the door sticker is not still there I would almost want to pull a front fender to look at VIN# on the inner fender shock tower. The Ford VIN# tag is in the dash on drivers side but you can swap dash upper out from 71 - 72 to a 73. The 73 dash is also different in that there are two Phillips screws near the front edge of the pad that are not in a 71 72. Could be a VIN# switch. Here in NC they verify that when you register the car. The rivets that hold the VIN# in the dash are special and should look like a flower not just a round pop rivet. They are very expensive to obtain. Part of keeping you from switching VIN#'s. on drivers door. It was build in July 1972. had 5 miles when I drove off lot. Any info is deeply appreciated.